Here’s a peek into the Montgomery County, Pennsylvania, Fire Academy, where this week’s seminars were held. An excellent facility located in Conshohocken, PA, which is about 15 miles west of Philadelphia. Granted, there’s a *lot* off traffic in this part of the country, but If you stay off of the freeways, the drive is nice along Highway 23; rolling hills, lots of trees, gorgeous homes, and green spaces. All in all, a pleasant place. I just can’t figure out the meaning of the unusual town names, such as Gladwyne, Bala CynWyd, Bryn Mawr, Berwyn, Pencoyd, Manayunk, etc. 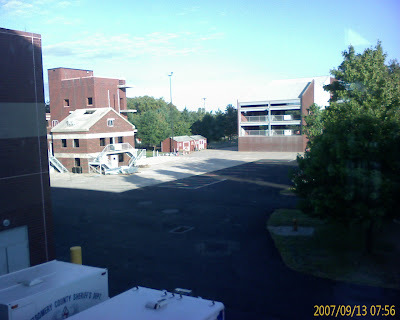 This entry was posted in Montgomery County Fire Academy on September 14, 2007 by codewienie.